The 12AG can be powered either from a mains/line supply or from an external DC supply (12 V - 18 V), e.g. a car battery. It is built into a sturdy anodized aluminium cabinet. And the voltage supply for the preamplifiers can be set to 120 V — for maximum dynamic range, or 28 V — for minimum power consumption; may be important when using an external DC power supply. The input to each channel is a 7-pin LEMO socket on the front panel which is wired up for GRAS microphone preamplifiers, e.g. 26AB, 26AC, 26AJ and 26AK, but is also compatible with other available makes of microphone preamplifiers. The output of each channel is via a standard BNC connector also on the front panel as well as via one of the 4-channel VXI outputs on the rear panel. Each channel has two overload indicators; one instantaneous, and one latched which can be reset by a common push button. The gain in each channel can be set from 0 dB to + 50 dB in steps of 10 dB. The standard A-weighting filter in each channel complies with IEC Standard 60651: Sound levelmeters Type 0. The high-pass filter in each channel is a 3-pole Butterworth filter with a – 1 dB cut-off at a frequency of 20 Hz. This filter is for reducing unwanted low-frequency signals, e.g. caused by wind-induced noise on the microphone. The preamplifier signal in each channel can be coupled directly to the output of the 12AG by selecting direct output. This makes the output of the preamplifier available free of any signal conditioning. A built-in precision 1 kHz oscillator in each channel enables a complete check of the measuring channel when used with GRAS preamplifiers 26AJ, 26AH or 26AL. The oscillator can be activated directly via a common push-button on the front panel or remotely via a common mini-jack connector placed on the rear panel. The output levelof each oscillator can be adjusted using a small screw driver on a potentiometer accessible via a hole in the front panel. 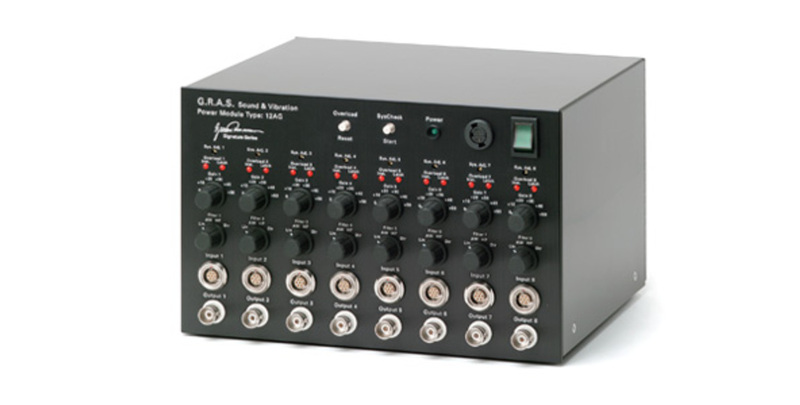 The cabinet of the 12AG is 1/2" of a standard 19-inch rack; meaning that 2 of these Power Modules can be mounted in a standard 19-inch rack using the AK0040 Rack-mounting System.